Find hotel near Beaconsfield Historic Hou ..
Beaconsfield Historic House stands as a fine example of Victorian architecture with many features that have survived the test of time beautifully. The most interesting part of the house is that it has a fascinating story to tell. Built in 1877, the house was one of the most beautiful homes in that time. The initial owners James and Edith Peake could not enjoy its fine craftsmanship and detailing for too long as it was soon transferred to Henry Cundall. It is open year-round for tours and hosts lectures, concerts and other special events in the Carriage House. How popular is Beaconsfield Historic House? People normally club together Fanning Bank and Victoria Park while planning their visit to Beaconsfield Historic House. Our guide, Luke, was fantastic!! Very knowledgeable and friendly. I like history, anyways, but he brought the story to life with interesting tidbits. Fascinating details about the architecture and furnishings. A great way to learn about the Victorian era in PEI and a perfect way to spend a chilly springtime afternoon. 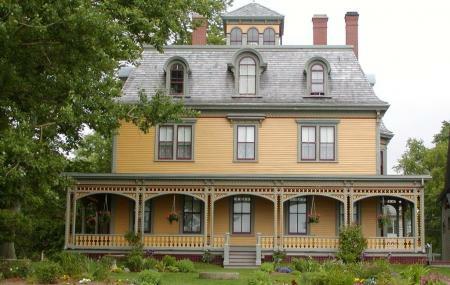 A lovely historic Victorian era home on the waterfront. Tours/entry is only 5$CAD per person, so why not take the tour? I did feel, however, that our tour guide could’ve used a bit of improvement- she seemed a bit nervous, and not very talkative. Otherwise, it is well worth a visit. The grounds themselves are well-maintained, and connect with a waterfront walking trail. Will take tour next time we are in Charlottetown, BUT very big props to the staff. Last Tuesday, our son had to use their washroom just as they were closing for the day. They let us in & he took his eyeglasses off in the stall & left them in there. None of us noticed this. We left PEI without knowing where they had disappeared to. When we were 1 hour from home in the Toronto area we finally retraced our steps correctly and realized that they were likely there & maybe staff collected them & kept them safe until somebody claimed them. We spoke to them the next morning & today they arrived. If you are heading to Charlottetown soon, please take a tour of this beautiful house for us. Fantastic people working there! This place is a purely awesome place to go to. When you are here it is very informative and nice. The guide is very friendly and makes the history interesting.